I personally love handmade gifts. They don’t always have to be big elaborate gifts, sometimes, it’s just nice to give a small – “Hey, I’m thinking of you” kinda gift!. These candles from the Dollar Store are perfect to keep on hand when you need to give a little something. 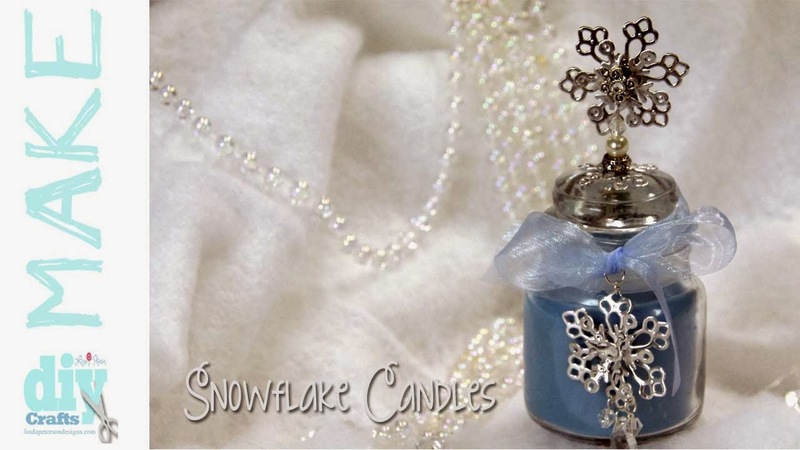 During the winter season, I love decorating with snowmen and snowflakes and how easy it is to do with the dies from Spellbinders! Decoupage music sheet onto canvas and let dry. Sand excess paper away with sanding sponge. Using finger or cosmetic sponge apply blue and green color over the music paper. Rub away excess with baby wipe to leave some of the music paper showing through. Cut one large and one medium circle using the #2 and #3 (with #1 being the smallest) Circles Three dies. Decoupage them to the canvas. Cut one small snowflake from foil if desired. Paint over snowman with off white, rubbing some of the paint away to expose the paper underneath. Add white for highlights. Paint a red scarf using a slightly curved line between the body and head and add two long triangles for scarf tails. Add white highlights. Let dry. Paint in cheeks with a blend of red/white and a small orange nose. Let dry. Cut out phrases and decoupage them to the surface. Let dry, then outline with marker. Outline the snowman, add “x’s” for eyes and mouth and draw in any extra details. Frame the canvas with random lines around the perimeter.